It’s kinda crazy after fantasizing about eating them by the dozen, comparing the flavours and seriously judging them from all the different famous places. Half way through the trip I got some mild food poisoning and didn’t want to eat anything for about 24 hours. During that time we passed by Ladurée and Pierre Hermé and I couldn’t even bring myself to go in and buy some for when I was feeling better. If you know me even slightly, you will know that this is alarming behaviour. I can eat baked goods and sweets all day long and often do. That said… YUM! I’m glad I waited until Paris to try them, they are delightful. I did try them from 3 different places. One place was just a random shop to see what the difference is between a renowned macaron and a regular one. There is a definitely a difference. 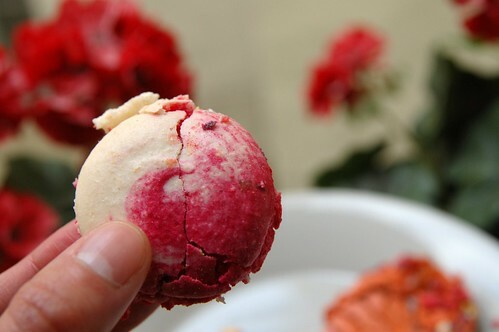 The fillings on the ‘regular’ macarons seems more like jam than a flavourful filling. 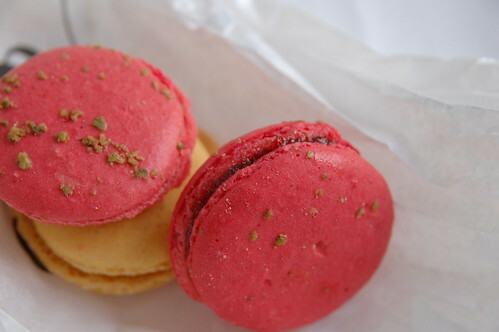 The first macaron I had was framboise (raspberry) from Jean-Paul Hévin who is a well known chocolatier. The other flavours I got there were various chocolate combinations and they were also delicious. The other place I tried was Arnaud Delmontel. His creations were more colourful and the flavours more varied. Unfortunately, I let these ones get a bit smushed up carrying them around and only got one good photo (the cracked pink and white macaron below). The standout flavour for me here was the salted caramel. Hopefully next time I’m in Paris I’ll really get to enjoy the world of macarons. For now, I’m happy to finally know what all the fuss is about. 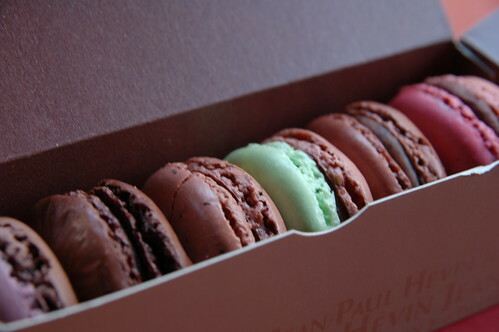 I love Laduree Macaroons from Paris! These look so delicious! I’ve never had a macaroon, I’m not even sure I know what they are. But I now know just how beautiful they are. I’m so jealous. 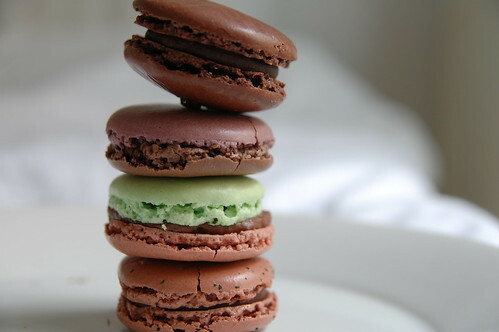 I’m dying to go to Paris and macarons are one of the main reasons! They look soooo delicious and all the new colours and flavours…mmmm….Sorry, lapsed into a macaron daydream just for a minute. what’s your favorite flavor, karyn? I agree!!! 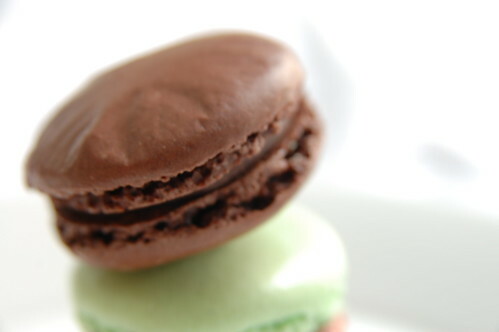 I love the macroons from Laduree! I haven’t been to Paris in a while but I get friends to bring them home for me every time they go back. YUM!! YUM! !